I know it's been a while since I've posted anything food related - and the fair food yesterday doesn't count. And not that I haven't been cooking, it's just been the same ol' same ol'. 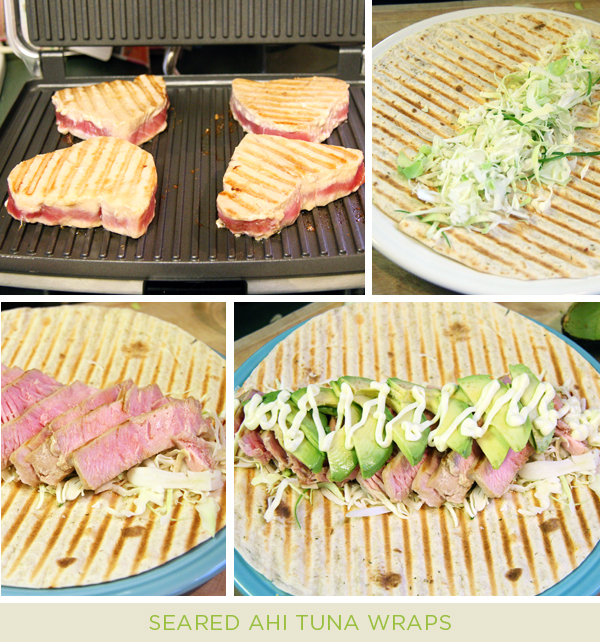 So this week I went out on a limb and tried making some ahi tuna wraps. My husband bought some tuna steaks at the store a bit ago when they were having a huge seafood sale - and, no, he doesn't usually do the shopping. It was late, we needed milk for the morning and he came back 45 minutes later with 3 bags of groceries. That's why he doesn't do the shopping. First, in a small saucepan, whisk broth, soy sauce, sugar, wine, ginger, garlic and coconut milk together and bring to a boil. Reduce heat and simmer 5 minutes. Pour into a small bowl and refrigerate until cool. Once the sauce is cool, place the tuna steaks in a gallon ziploc bag or dish and pour all but a few tablespoons of the sauce over to marinate. Marinate the steaks for at least 30 minutes. While the tuna is marinating, make the wasabi mayo. It's really easy. Just mix the mayo and wasabi together. That's it. Use more or less wasabi to your liking. I also went ahead and sliced the avocados so they'd be ready. Here's a little tip you probably know of, but it not, here you go. Cut the avocado in half and remove the seed. Then make cuts, without going through the skin, lengthwise to make your slices. Do that to the other half and squirt lemon juice on each and then put them back together. This will keep it from browning. Plus, when you're ready for the avocado slices, just run a large spoon between the avocado and skin and voila! Sliced avocado ready to go. Then just sear your tuna. I used my panini press and it worked great. I probably broke some kind of tuna rule here on how I cooked mine, but hey, I'm pregnant so I had to cook these things a little longer than you should. After you remove it from the grill, cut it into thin slices. Now assemble your wraps. 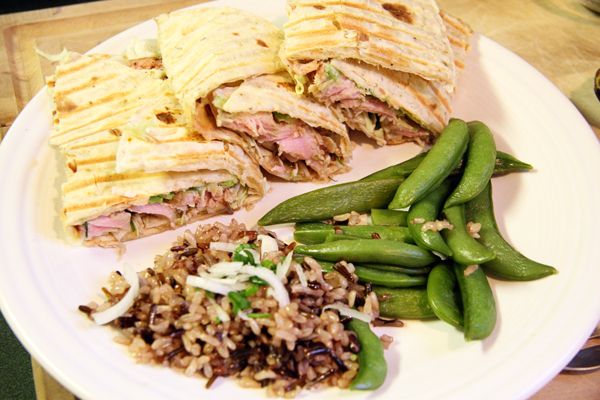 I warmed my wraps on the press before cooking the tuna but it's not too important. Put a handful of cabbage down the center of your wrap, top it with a little sliced onion, then the tuna, add the avocado slices, season with a little salt and pepper and top it all off with wasabi mayo. Fold each side over and cut it in half and enjoy! looks delish! love me some seared ahi!!! !